Just about everyone is 'for' development as an assumed 'good', yet few seem to have a concrete idea of what the term actually entails. Development offers a comprehensive and wide-ranging analysis of the various ways in which this important concept has been used in social and political analysis over the past 200 years. The concept of development has never been in greater need of analysis and clarification than in the present era. Just about everyone is 'for' development as an assumed 'good', yet few seem to have a concrete idea of what the term actually entails. 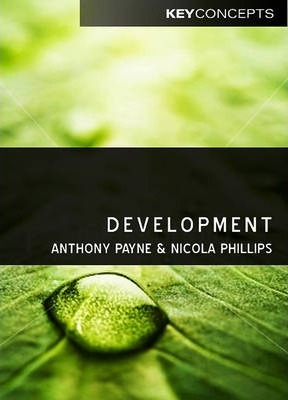 Development offers a comprehensive and wide-ranging analysis of the various ways in which this important concept has been used in social and political analysis over the past 200 years. Starting with the classical theories that sought to explain the initial development of the industrialized world, the book moves on to consider the 'golden age' of development theory after 1945, before bringing debates right up to date by assessing current and future trends in development thinking. The evolution of development theory is charted in innovative ways, relating it concretely to the successes and failures of development both in different eras and places. In a fresh evaluation of the current debates on this concept, the authors suggest that the time has now come to move away from a specialist field of 'development studies', and instead to re-ground the study of development squarely within the intellectual project of a new political economy. Written in a lively and engaging style, this book will provide a valuable point of access to past and current thinking on the concept of development for students across all the main social sciences. Anthony Payne, University of Sheffield, UK. Nicola Phillips, University of Manchester, UK.